Our Trolley Guests Have Spoken! Stop #1 is in front of the Sponge Market, next to the Key West Aquarium. Trolleys will pull up to the American flag, near the shark. Across the street is the Island Juice Bar. On Whitehead Street at the foot of Caroline Street. Near the corner of David Wolkowsky and Wall Street. Stop #1a is in front of the Presidential Gates at the entrance to Truman Annex. Trolleys pull up before the Presidential Gates. The Harry S. Truman Little White House is located one block behind the Presidential Gates. Stop #2 is on a service road between Margaret and William, running parallel with Caroline. Guests can wait inside Mac\'s Sea Garden Gift Shop and see the trolleys pull up. Corner of Simonton and Greene streets. Stop #3 is on the corner of Simonton Row, in front of Diver's Direct, on the northwestern side of the street. There is a bench available for waiting guests. Across the street is Key West Aloe. Stop #4 is directly in front of the Crowne Plaza La Concha Hotel on the west side of Duval Street. The trolley will stop in front of the entrance doors to the hotel. Corner of Whitehead and Petronia. Stop #5 is in front of the Bahama Village complex directly on the corner, on the western side of the street. Stop #6 is located at the Fairfield Inn Hotel. The trolleys will stop in the central area of the parking lot. Stop #8 is located at the Best Western Key Ambassador Hotel. The trolley will stop in front of the office area. Guests can wait inside the lobby and see the trolleys arrive. Stop #9 is at the East Martello Fort and Museum. The fort is located in front of the Key West International Airport. Trolleys will pull in front of the Museum in the parking lot. Across the street is the Atlantic Ocean. Stop #10 is at the front doors of the Waldorf Astoria Casa Marina Hotel, railroad magnate Henry Flagler's showpiece. The trolley will pull into the parking lot, stopping in front of the doors. Stop #11 is located at the Southernmost Point Gift Shop. Trolleys will stop directly in front of the store. Guests shop inside while waiting, or benches are available outside. Stop #12 is located on the southeastern side of Duval Street. Trolleys will stop on Duval Street near the corner. Corner of Angela and Duval. Stop #13 is immediately on the northwestern corner where Angela meets Duval. Trolleys will stop on Angela Street, in front of the benches. Witness one of the world’s most majestic settings at Mallory Square. Here’s where everyone comes to see, eat, shop and linger. Buy a locally collected sea sponge and stop in at the famous Hog’s Breath Saloon. Mallory Square is where it’s all at and where it all comes together. It’s also where the evening transforms into the renowned sunset celebration and when street performers, colorful entertainers and mouth-watering foods emerge as the sun begins to descend. Browse through the unique shops, pick up a souvenir at Ron Jon Surf Shop and see the local attractions. Find out what all the excitement is about. A visit to Key West must include a stop at Mallory Square. Your email address will not be shared with a third party, nor will it be sold or used for purposes other than providing you with directions to the selected destination. Key West Aquarium Key West Shipwreck Treasure Museum Truman Little White House Customs House Museum Mel Fisher's Maritime Museum Audubon House Key West Glass Bottom Boat Key West Historic Memorial Sculpture Garden Waterfront Playhouse Theater Key West Fury Water Adventures Ripley’s Believe It or Not! Welcome to Key West’s first attraction. Meet stingrays and pet a shark! See them eat and watch in wonder as a variety of sea creatures swim around in their natural environment. Come to the Key West Aquarium for an encounter with some of the world’s most mysterious and beautiful marine animals. Since 1934, the aquarium has been wowing guests with its variety of sea species. Listen and learn as knowledgeable guides explain the underwater world that surrounds the Florida Keys. Feel the exhilaration as you climb 65 feet in the air to the top of the observation tower for panoramic views of Key West. Inside the Key West Shipwreck Treasure Museum, you’ll have that opportunity and more. Find out how those who made their living off shipwrecks in the 1850s watched and waited for ships sinking off the coast in Key West. 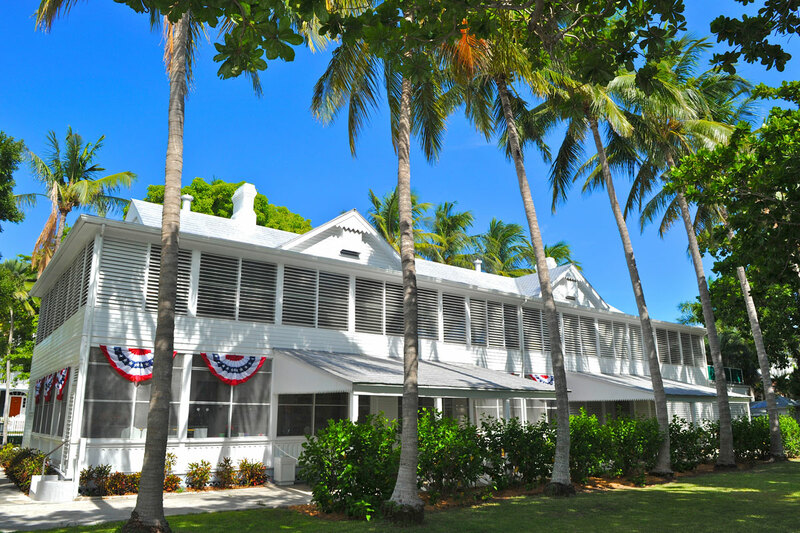 A place where an array of leaders, legendary inventors, dignitaries, visionaries and many prestigious visitors were drawn to throughout its history, Key West’s Harry S. Truman Little White House holds a special place in the history of America. Constructed in 1890 to serve as the naval station’s command headquarters during the Spanish-American War, World War I and World War II, this historic site later became the second White House. For a bit of history and a look at how Key West got to where it is today, stop in at the Key West Museum of Art and History inside the Custom House. Built in 1891, the Custom House had many uses including a post office, court house and government center. Today, after a $9 million restoration, the beautiful red brick building is as glorious as it was back in the day and is home to moving works of art that portray the colorful past of Key West and historic national events. “Today’s the day” was Mel Fisher’s mantra. Fortunately, his lifelong hunt for ancient buried treasure was realized before he died so his mantra held true. The day was July 20, 1985, when, after 17 years of searching, Mel Fisher and his crew recovered $450 million worth of buried treasure from ocean floor just offshore from Key West. The Nuestra Senora de Atocha and the Santa Margarita, two Spanish galleon ships that sunk in 1622, carried 40 tons of gold and silver, Pieces of Eight gold coins, Columbian emeralds, over 1,000 bars of silver and other gold artifacts. The Audubon House marks the beginning of the restoration movement in Key West. Saved from being demolished in 1958, the 19th century Key West gem is a historic museum featuring the artwork of John James Audubon. Famous for his exquisite drawings of birds in their natural habitat, Audubon stayed in the home in 1832. Embark on an adventure to the world-famous reefs off the coast of Key West. Aboard the Pride of Key West — the magnificent Key West Fury catamaran with a glass bottom, you’ll enjoy the fresh sea air as you voyage above the lively marine world underneath. Once you arrive above the reefs, be ready to catch your breath as vibrant sea life abounds right beneath your eyes. A lasting tribute to the most famous and influential residents of Key West, the Key West Historic Memorial Sculpture Garden is an oasis shared by all who live on the island. Featuring impressive bronze busts of Ernest Hemingway, Asa Tift, Harry S. Truman and others, the garden also includes a scenic walkway paved with memorial bricks that are purchased by local citizens then engraved with their names or the names of a loved one. Located on Mallory Square, the Waterfront Playhouse Theater is the oldest continuously running theatre group in Florida. For 65 years, the theater has brought laughter and entertainment to the residents and tourists of the Keys. People from all over the world come to Key West for the unique atmosphere, world-famous attractions and, of course, the refreshing turquoise waters that surround the island. Whether you’d like to dive in and snorkel, fly above the water in a parasail, go on a glass-bottom boat excursion, take a sunset cruise or try your hand at jet skiing, Fury Catamarans offers a myriad of exciting adventures. Ripley’s Believe It or Not! What could be weirder than a two-headed animal or a man standing almost 9 feet tall? Find out at Ripley’s Believe It or Not! The oldest house in South Florida was built in 1829 by Captain Francis Watlington who was, among other things, a wrecker. Watlington and his wife and their seven (of nine) surviving daughters lived in the house for many decades. A beautiful example of the kind of colonial architecture found in the Caribbean, the house is now a museum that welcomes visitors from around the world. Guests see gold that was salvaged from shipwrecks, paintings, model ships and a separate kitchen. Furnishings, carpets and the house décor all reflect the era of the wreckers and their success that made Key West the richest city in America at one time. There’s also a lovely garden with benches offering a shady spot to rest and relax. Learn a little history, admire the ancient architecture and more at the Oldest House Museum. Key West’s historic seaport has long been a hub of activity on the island. Hundreds of years ago, sea captains found the area a useful and safe stopping point in their journeys. It was the epicenter for industries including sea turtle fisheries, shrimp and sponge fisheries. Today, the area has maintained its charm, with a lovely mix of old and new and offering visitors not only a scenic view but also a variety of unique attractions in the midst of restaurants, shops and activities. Experience a journey like no other aboard the Yankee Freedom III. Take your comfortable seat and enjoy the relaxing ride to the Dry Tortugas National Park Fort Jefferson, just 70 miles west of Key West. The Yankee Freedom III is recognized for its speed and luxurious accommodations and for transporting thousands of visitors annually to the beautiful collection of islands called the Dry Tortugas. Just a short distance from Turtle Kraals, on Caroline Street, is a longstanding Key West favorite. Pepe’s Café first opened its doors in 1909 making it the oldest eating-house in the Florida Keys. For a taste sensation you won’t find anywhere else on the island, stop in at Turtle Kraals Key West Restaurant located directly on the historic waterfront on Margaret Street. Come celebrate the triumph of Henry Flagler and his determination to connect Key West with the rest of the U.S. by train at the Flagler Station Over-Sea Railway Historeum. The Railroad was completed on January 22, 1912 after seven years of hard labor, torrential weather and mosquito infestations. Don’t spend your precious sightseeing time in search of the perfect parking spot. Drive into the Old Town Garage at the Corner of Caroline and Grinnel and park in a covered spot. The Museum is a free attraction located in Key West’s Historic Seaport, known as the “Bight.” Exhibits include an 11-foot diameter scale model of Fort Jefferson, an interactive photo mural that explores the history of the Bight and a Junior Ranger Exploration Station that allows children to get hands-on with and learn about the natural resources of the Dry Tortugas. Where to go when you’re ready for a slice of award-winning key lime pie or a bit of local history with a world-famous cocktail? Head to Old Town between Simonton and Greene. On the corner of Duval and Front Streets; The Hogs Breath Saloon is one of those places you just can’t miss while visiting Key West. If you haven’t partied at Rick’s Bar, you can’t leave Key West until you do. Located right on Duval, Rick’s is not just a bar; it’s 8 bars – each with its own unique venue and all offering a one-of-a-kind experience. The famous Sloppy Joe’s Bar is more than just a local watering hole where you can stop in for some live music, cold drinks and good food, it’s a Key West tradition. A gathering place where locals and visitors mesh, this well-known bar has hosted thousands of patrons through the years, the most celebrated being Ernest Hemingway. A visit to the Southernmost City is incomplete without a stop into Sloppy Joe’s Bar – but before you go, check out this guide. Located in a bright green and yellow storefront at 802 Duval Street, Kermit’s Key West Key Lime Pie Shoppe was founded more than 20 years ago. Since then, Kermit’s has established a reputation for its tasty Key lime creations – including being recognized as having the best Key Lime Pie by Food Network, National Geographic and Paula Deen. One of the hottest spots to be in Key West is the world famous Duval Street. You could spend an entire afternoon or evening wandering up and down this well-known stretch and you’ll quickly discover why so many people flock here. The character and personality of Key West comes to life in a variety of celebrated restaurants, bars, art galleries, locally owned shops and much more. Located at 830 Caroline Street, this art gallery began showcasing a variety of artistic works in 2007 when locals Tony Gregory and Christine Scarsella decided it was time to fulfill their dream. A unique mom and pop art gallery, Two Monkeys Purveyors of Fine Art on Fleming Street offers an original Key West experience to all who visit. The gallery has a variety of contemporary tropical art by Amanda Johnson, a local artist who captures the many facets of life in Key West. History thrives at the Crowne Plaza La Concha where vintage Key West meets modern day. Built in 1926, the Crowne Plaza La Concha is located on Duval Street, just a few blocks away from all the excitement and hustle of Old Town. The Crowne Plaza La Concha is where the prominent came and where history was made. After a multi-million dollar renovation, the hotel was restored to its original grandeur and reopened in 1986. Today, travelers from across the globe reside in the Crowne Plaza La Concha and enjoy the opulent accommodations, exquisite time period furnishings and the attentive service. From the grand lobby to the celebrated quarterdeck on the top floor, the Crowne Plaza La Concha is one of the most well-known spots in the city. As part of the San Carlos Institute, which was founded in 1871 to help the Cuban community in Key West, the San Carlos Theater offers a variety of entertaining productions throughout the year. It’s the first and oldest theater in Key West, and was once a home to touring ballets, opera and theater companies. Today the San Carlos Theater, after a magnificent restoration, offers concerts and other theatrical events. For those who love film and not the mainstream box-office variety, Tropic Cinema in Key West has got a ticket just for you. The theater was founded after a group of disenchanted film buffs got together to bring unique documentary, independent and foreign films to Key West. The group, now called the Key West Film Society, rapidly gained support from the community and soon the Tropic Cinema was created. Established in 1832, St. Paul’s Episcopal Church is the oldest church in South Florida. The current church is the fourth to occupy this location, the previous churches being destroyed by fire and hurricanes. Visitors today will find a magnificent collection of stained glass windows and free organ concerts Monday through Friday at 12:15 by music director Joe Lowe. Get a taste for the Caribbean heritage that is so much a part of Key West. In Bahama Village, which is a 12-block area between Whitehead and Fort and Angela and Catherine Streets, you’ll be able to see the original area in which the first black Bahamian settlers arrived in the 19th century. Sample true Bahamian culinary recipes in a variety of restaurants, stop in for a refreshment in one of the bars and shop in the Bahama Market. All the flavors, culture and traditions that this historic neighborhood represents come alive through the many streets. This lovely Key West home is where legendary author Ernest Hemingway lived and worked for more than ten years. The home and gardens are visited by thousands of people each year, offering a glimpse into Hemingway’s life and a chance to meet some of the descendants of his beloved six-toed cat, Snowball. If you’re up for a climb, you’ll be rewarded with stunning views of Key West and the ocean. The Key West Lighthouse was built in 1825 to help the many ships entering the port avoid the hazardous reefs. Today, you can climb the 88 iron steps to the top of the tower for a scenic look at what the lighthouse keepers watched over for more than 120 years. Tour the grounds to see the Keeper’s Quarters which have been restored to their original charm and view the displays of nautical artifacts, antique furnishings, maps and vintage photos. Come for a drink, stay for the music. This more than 100-year old Key West dive bar is where locals come to kick back, drink a few and get an earful of the best touring bands around. One of Key West’s best values, The Fairfield Inn & Suites by Marriott, just completed a $7.5 million renovation. There are 106 rooms and suites with Marriott-quality amenities, state-of-the-art fitness center, temperature-controlled outdoor swimming pool, poolside tiki bar, free high-speed wireless internet access, complimentary deluxe continental breakfast, and more. And it is just minutes away from the beaches and the shops, restaurants, and clubs of world-famous Duval Street. The Key West Yacht Club is the Southernmost Private Club in America with 68 wet slips in various sizes, 3 transient rental slips, dock restroom facilities with showers, boat ramp, full service dining room and bar, ships store and gift shop. Garrison Bight Marina is the only dry storage marina in Key West complete with a full service of certified master technicians, top-of-the-line boats for sale, used boat consignment program, Tackle Shop for fishing, ship store for every boating need, charters, boat rentals and more. Welcoming guests from across the globe beginning in October 2007, the Marriott Beachside Resort is opulence at the edge of the turquoise sea. A perfect blend of luxury and style combine to pamper guests with all the amenities expected and then some more. Breathtaking views, marvelously appointed guest rooms and suites and a grand two-story lobby add to the alluring waterfront setting of the resort. The Key West Tropical Forest & Botanical Garden is the only frost-free sub-tropical native botanical garden in the continental United States. Here you can see many endangered and threatened flora and fauna. A beautiful and serene respite, this special place will take you back in time and allow you to be among butterflies, birds, plants and seasonal flowers. Featuring the Modern Minimalist design, the Gates Hotel sits on the northeast tip of Key West where US Highway 1, also known as the Overseas Highway, enters the island. Set against the backdrop of this tropical oasis, the highly ranked boutique hotel incorporates art, food and music with sophisticated service. Channeling the spirit of Hemingway, the eco-friendly hotel features reclaimed whitewashed beams, a cigar garden and a rum bar. In addition to contemporary amenities like in-room Wi-Fi, guests have easy access to the unique sights and sounds of the self-styled Conch Republic. The Best Western Key Ambassador Resort has 100 spacious, modern rooms. Many of the rooms have a view of the water. Complimentary continental breakfast, outdoor pool, multilingual staff, concierge, free parking, free high-speed internet access, airport courtesy shuttle and more. The East Martello Fort, complete with an eight-foot thick granite wall, was built during the Civil War Era to withstand any bombardment but was never completed and never saw any hostile action. The casemates, citadel and courtyard today make up the museum. Among its collection are Key West artifacts, historical records and military memorabilia. Also on display are the state’s largest collections of painted wood carvings and drawings by Mario Sanchez. In addition, the fort is also home to Robert the Doll, the most famous haunted plaything in the world. Smather’s Beach is the largest beach in Key West which runs along the southern shore. The beach offers activities such as volleyball and watersport rentals, and vending trucks offer snacks, beverages, chairs, and rafts. There’s plenty of parking, restrooms, chair rentals, picnic tables and more. The Casa Marina Resort and Beach House is an icon in Key West. It was built by Henry Flagler for his passengers on the overseas rail road in 1920 and exudes splendid Mediterranean charm. Sophistication and luxury mesh beautifully with this ideal Key West locale offering visitors a heavenly retreat in the midst of historic sites, natural beauty and enticing attractions. Ocean view rooms, an expansive private beach and a gorgeous swimming pool make it easy for guests to relax and appreciate every moment of their stay. For a truly serene experience, take a moment to stroll through the Key West Garden Club at the West Martello Fort. A popular spot for weddings, lush, tropical plant life, quaint brick pathways and glorious arched courtyards make a visit here unforgettable. A National Historic Site, the fort features gun mounts, a conservatory and a brief glance back at the Civil War era. Guests can view a rare collection of native and exotic trees and plants, including blooming orchids and bromeliads. A water lily pond and waterfall add to this site’s charming allure. Visitors are welcome to stroll, sit, relax and reflect at this free attraction. Key West was never a slave port, but in 1860, 3 slave ships headed for Cuba were intercepted by the U.S. Navy. 1,432 slaves who survived the transoceanic voyage were brought to Key West for care. Despite the best attempts by the island’s residents, 295 are buried in shallow graves near the West Martello Fort. Remembering those who were lost to AIDS, the Key West AIDS Memorial is a touching tribute that makes a lasting impression on all who view it. The names of those who have died from AIDS are inscribed on flat granite which makes a walkway on the way to the White Street Pier. It was dedicated on World AIDS Day in December of 1997 and at that time 730 names were included. Sadly, today there are 1,000 names listed on the memorial – all people who lived, visited or worked in Key West. Each year new names will be engraved until the memorial capacity of 1,500 names is reached. The dedication of the new names occurs on World AIDS Day, which is December 1 of every year. A somber site, many come to remember their loved ones, family or friends. Hit Higg’s Beach for a true Key West beach experience. A popular beach wedding location, too. Locals love it and so do visitors, including brides who dream of a Key West beach wedding. The white sand and wooden pier make ideal spots for sunbathing and the beach offers umbrella rentals for those who prefer to doze in the shade. There are tennis courts, a restaurant, volleyball courts and more. For the kids, make it a point to stop by Astro City, an awesome playground located just across from the beach. This historic tower was built in 1862 during the Civil War and is one of three remaining Civil War era structures on the island. Although it was often used for target practice by the United States Navy, the fort was never actually involved in a battle. It is now home to the Key West Garden Club. Located at the southernmost end of Duval Street, the Key West Butterfly & Nature Conservatory is one of the island’s most popular family-friendly attractions. It’s home to more than 60 species of butterflies and 20 species of exotic birds. A visit to the Key West Butterfly & Nature Conservatory is divided between the climate-controlled conservatory where the butterflies flutter freely, the learning center, an art gallery and a gift shop. Key West is famous for being the southernmost city in the continental United States. When you visit, it’s essential that you make it to the southernmost point on the island, found at the intersection of Whitehead Street and South Street. Here, you’ll see the landmark Southernmost Buoy (a required photo opp) and a whole host of other “southernmost” attractions that make for a fun Key West afternoon. One of the most striking and distinctive buildings in Key West, the Southernmost House proudly sits at a prime location overlooking the Atlantic Ocean at the quieter end of Duval Street. This impressive example of Queen Anne-style architecture is just one of many iconic Key West attractions. Boasting a long history of hospitality, this building is now a historic adult-only bed-and-breakfast situated on the edge of the Old Town District. The inn boasts a retro, pastel-colored exterior, elegant gables and bold landscaping. It is the southernmost private residence in the United States. Although a few other living quarters are further south, they are located on the Key West Naval Station and are not open to the public. The hotel is one of the most-photographed buildings in Key West. Some say it holds sacred power, others believe it emanates spiritual strength. Find out for yourself what makes the St. Mary’s Star of the Sea Grotto Shrine so special. It was built in 1922 on orders of the sisters of the holy name of Jesus and Mary who believed the coral rock shrine would protect Key West from the devastation of hurricanes. After the tragedy of the 1919 hurricane that caused massive destruction and killed hundreds of residents, Sister Louis Gabriel decided a shrine was a necessity. To this day, people from all over the island come to the site to pray when a hurricane threatens. The legend still lives on although Key West has had its share of damaging storms and near misses. After seeing some of the city’s most colorful and quirky characters on Duval Street and in Mallory Square, take a moment to visit the Key West Cemetery, where it is said that close to 100,000 original Key Westers are buried. It’s an excursion that offers history, at the bast of lighthearted humor. Located on Solares Hill, which is the highest point of elevation on the island, the cemetery opened in 1847 after bodies from the original cemetery washed ashore during a storm. Stroll through the 19 acres and see if you can find the headstone that reads “I told you I was sick”, or “At least I know Where He’s Sleeping Tonight”. Select content you would like displayed on map. Check out what guests are saying! Sign up to receive our latest offers and promotions. This website meets AA standards set by the ADA. Please click here for more information. Seating aboard vehicles operated in interstate or foreign commerce is without regard to race, color, creed, or national origin in accordance with Title 49 CFR 374.103.